The Bunyan Marsous Operations Room says it has taken control of the key Ouagadougou Centre in Sirte, used by the so-called Islamic State (IS) as its headquarters, as well the town’s Ibn Sina Hospital and the university. The university was the first to be liberated today. 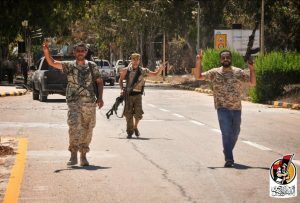 The operations room has also disclosed that a Libyan fighter plane was lost during the day’s offensive. It is not known if it was shot down or crashed because of technical problems. IS, however, have claimed to have brought it down. The pilot is reported to have been killed. It is the second aircraft to be lost over Sirte in the past two months. A MiG was lost on 2 June. At the time IS claimed it had shot it down but Bunyan Marsous counterclaimed it had suffered a technical failure. Today’s battles come after the US Africa Command (Africom) announced that on Monday it carried out another eight airstrikes on several IS positions in Sirte, bringing the total at that point since the beginning of the month to 28. Further strikes, though, are reported to have been carried out yesterday and today, although there has been no official announcement so far. Meanwhile, Faiez Serraj, the head of the Presidency Council, has predicted that the battle against IS in Sirte would be over within a few weeks. “Our soldiers had been highly successful in recent times against the men of the Caliphate”, he said in an interview with the Italian daily Corriere della Sera. For that reason, he insisted, Libya did not need foreign ground forces in the fight against IS. However, it did need air support because of IS tactics. That was why he invited the Americans to help, he said. But the request for the US help, he noted, had come direct from those fighting IS in Sirte. Libya also needed more sophisticated weapons for the street battles being waged by IS, he explained. As to Italy, he thanked it for having allowed the Americans to use Sigonella airbase in Sicily to attack IS but Libya did not need any military support from the Italians. What it did need, he said, was that Italy treat Libya’s war-wounded. “Medical aid and visas for the transfer of our wounded in your area should be faster,” he told the interviewer, adding that some field hospitals “would be very useful to quickly treat our seriously injured on the front lines”.